Hand poured using a soy wax blend in a recycled and reusable distressed tin container. Made with soy wax and cotton wick, it contains no phthalates, parabens or sulphates, and has not been tested on animals. Produces less soot and packed with more essential oils than standard candles to leave your room full of scent. 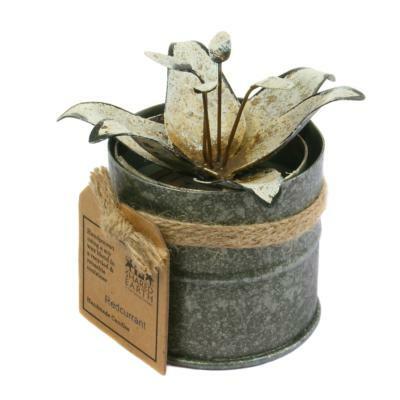 The recycled metal lid helps protect your candle from outside pollutants keep it burning clean every time. Warning: Keep burning candle within sight. Keep out of reach of children and pets. Never burn a candle on or near anything that can catch fire. Container will be hot when candle is lit. Always trim wick before lighting. Burn candle until wax melts across the width of the candle. Do not burn for more than 4 hours. Extinguish candle within half an inch of wax remains in the bottom.